55 out of 55 (100.00%) customers would recommend this product to a friend. Services and products are very good. We have been using your products for several years. I would recommend this product to everyone. The ink lasts a very long time. Perfect for teachers! A good value for my small business. The compatibles work well. Very impressed with how quickly I received the order. So far, so good. Time will tell if I get anywhere close to the 6500 page yield. All of the printer replacement cartridges purchased from Ink Technologies have performed equally as well as the brand name cartridges. I would highly recommend these replacement cartridges to any person or business who is looking for a quality product and a product that is easy on their budget. Working great in a school environment, low cost high quality aftermarket replacement. Have been using these cartridges for 5+ years. For the price and convenience, you can't beat this product. I tell all my friends in the office about this site. Great product at great price. Will recommend all products from Inktechnologies.com. Great product!! It works longer than the namebrand cartridges! This product is just as good as the name brand. I was a little skeptical at first thinking this cant be the same not for the low price that you purchase the product for, but it is. They seem to last just as long as the name brand. I really like their products. Affordable, long lasting, and fast shipping. Great value for the price, never had an issue...best price around. High quality product, great value!! we will definitely purchase again in the future! Commendable service and a great value product for the low cost! InkTechnologies.com has an excellent customer service department too. Highly recommend this company to others. Great product at a great price, I would recommend! I recently purchased a HP 20055n Cartridge and I was so impressed! It was Fed-Xed to me and is of comparable quality as the name brands at a fraction of the cost. I will definitely be back again! Thanks! Ink Technologies makes it easy to order my toner, always in stock. Price is compatible or better then other stores. Delivery always on time. I have already recommend Ink Technologies to others for good pricing and service. So Glad we switched to Ink Technologies. Great products and great customer service. This replacement cartridge is a great value and we have never had an issue with the quality of printing. Good ease of ordering, price and quality of product. The cost is such a bargain. Product works just as well as HP brand. Our company has used these cartridges for several years and are very happy with them. The order gets delivered quickly. Worked great...had no issues with delivery or print quality. Excellent quality for the price for any printer. Great value for the price, the print quality is good as well. Works as advertised. No issues with the cartridge leaking. Getting the page count as advertised. So far so good. Print quality is good.. value was great.. Just need to see the yield to make sure I am completely satisfied with it. I had concerns but decided the savings were worth trying it. It worked exactly like the much more expensive HP toner!!! You just can't ask for more at GREAT SAVINGS. I have used this product in the past and had good experience with it. The price is also reasonable. Very good product I will order again. I began using Ink Technologies years ago. I had searched many sites and found Ink Technologies to be the one to try. I was very impressed with every aspect of their service and continue to use them to this day. Each time I reorder, my order arrives in a very timely manner, in good condition, and it is correct. We print a lot of copies from the computer, especially during the first four months of the year and these cartridges hold up well. Price, quickness of service and delivery. Stumbled upon this website and found that they were very reputable. Ordered two pack for my HP 2055dn. Work like a charm so will definitely buy again. Just like the original - but at a huge savings! The print quality has been excellent, with the only difference being what I saved. This is a better quality product than some I have purchased. It is of high quality and I will continue buying in the future. A buyer gets more than their money's worth with this toner. Great customer service. Will order again soon. Excellent quality at great price. Purchased several times, always satisfied. Long lasting, quality printing. We have ordered this product several times and have always been pleased. I would recommend this to anyone with the same type of printer. We have been using these for going on 5 years...no problems. We do taxes so we use a lot during the season. These save me approx. 2/3 cost of a new cartridge. No one can touch these guys for cost, quality and reliability. A great buy, great price and easy ordering. It also ships fast. There isn't anything I don't like about this product - I've had salesman come to the office with what they think is a great price but no one can beat Ink Technologies and I have had no problems with the cartridge. I will most certainly order again. I have been using these cartridges for several years and have never experienced even one failure . Great! The ink lasts just as log as name brand. I have ad no complaints from personnel. This product is great,lasts and works!!! Excellent product and a big money saver!! Very satisfied with all aspects from ordering to using. The best value and quality for a reasonable price. The only place to buy your printer ink needs. Great product. Got 7000 copies on last cartridge. Great Great Great.. Saved my boss over $110.00!!!! THANK YOU!! This has been a great product with no defects or issues. Have used close to, if not more than 100 units. I own multiple tax preparation offices so we use a lot of toner. At $135 a pop, OEM cartridges are not a viable option. I've tried refilling them myself but that's a messy horrible job that only saves about $5 a cartridge over Ink Tech's price. I've never gotten a bad cartridge from these folks or been short-changed on the amount of toner (which I've experienced from other vendors). I recommend these guys wholeheartedly. A video providing specifications and replacement instructions for the New Compatible HP CE505X black toner cartridge. The CE505X toner cartridge is a high-capacity version of the CE505A cartridge, but is only compatible with the P2055 series, and not the P2035 series. It offers a yield of around 6,500 pages, based on 5% page coverage, and weighs around 3 pounds. When you receive your New Compatible HP CE505X toner cartridge, the first step is to unpack it. Remove it from the box, as well as the packing materials, and remove it from the bag. Before you remove the tape strip, take a moment to rock the cartridge forward and backward. This distributes the toner more evenly. You will notice a loop on one side of the HP CE505X cartridge. Place a finger inside this loop and pull it away from the cartridge until the entire tape strip is removed. Next, grasp the piece of black paper that protects the drum and pull it in the direction the arrow is pointing. Make sure your printer is on, then find and press the button at the top right of the machine to release the cartridge door and open it completely. You will see the empty HP CE505X cartridge. Grasp its handle and pull it straight out to remove it. Insert the new HP CE505X toner cartridge into the machine, aligning it with the tracks in the opening. Make sure it settles firmly into place, then close the cartridge door. You are now ready to resume printing with your New Compatible HP CE505X toner cartridge. 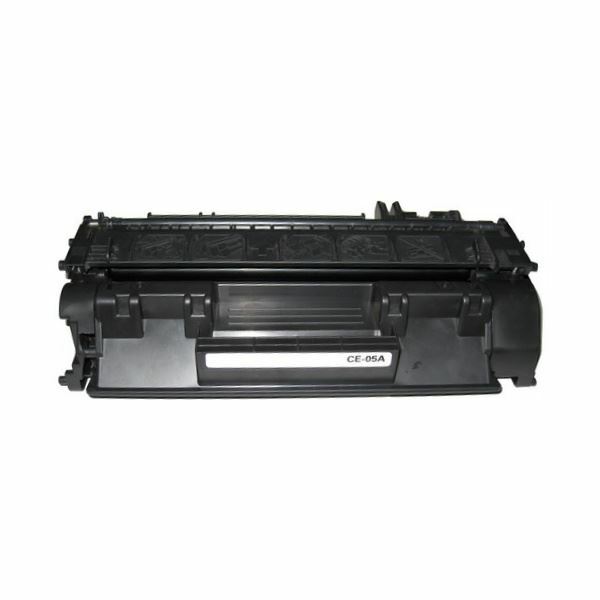 The HP CE505X toner cartridge is compatible with four models, including the HP LaserJet P2055, P2055d, P2055dn, and P2055x models. For a list of HP CE505X compatible printers, see the “Fits Printer Models” tab.